Imitators abound; originators are a special, scarce breed. 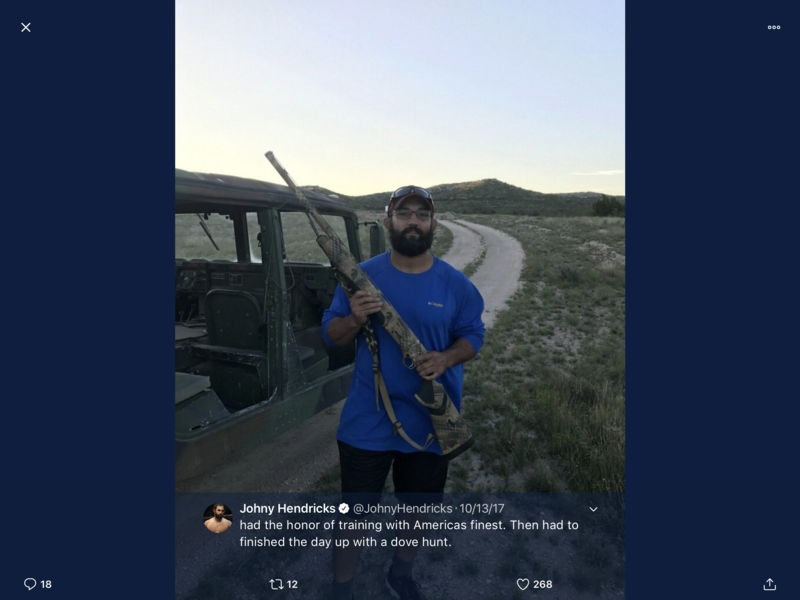 Johny Hendricks definitely ranks among the latter, a free-spirited, one-of-a-kind Country Boy whose simple life revolves around only a few passions: Family, Hunting, Fighting and Wrestling. Johny recently announced his retirement from MMA and this is my tribute to the former UFC welterweight champ, one of my favorite personalities in the sport and as boldly authentic as they come. This story, authored by Frank Curreri Forza, was originally published on UFC.com in 2008, early in Johny Hendrick’s pro fighting career. 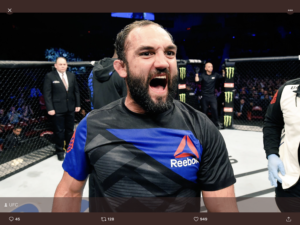 LAS VEGAS – Johny Hendricks is a cocky, arrogant, you-know-what (feel free to substitute with your expletive of choice). At least that’s the reputation that has shadowed Hendricks since his collegiate wrestling days at Oklahoma State University. The derogatory label followed him when he moved to Las Vegas and began training MMA at Xtreme Couture. His very first day in the gym none other than Phil Baroni, another guy with a reputation for being a flamboyant hothead, called him out. “Let’s go,” Baroni said, issuing the challenge. Baroni, a former UFC fighter with one-punch knockout power, was dead serious. Perhaps Baroni was simply marking his territory, trying to impose some humility on the visitor right off the bat. Hendricks, a former two-time NCAA wrestling champion, likely would have destroyed Baroni – if wrestling was the game. But it wasn’t. Their square-off was going to be a boxing match, a realm in which Hendricks was a novice and Baroni was a veteran. Being the stubborn, ultra competitive dude that he is, Hendricks accepted the virtual dare without hesitation. So each man put on a pair of 16-ounce boxing gloves and stepped into the ring. Little by little, as other fighters gathered around to watch, Baroni upped the ante. Every time he added more zip on his punches, Hendricks hfollowed suit by raising his own intensity level. Soon enough, Baroni was throwing everything behind his shots. Sometime around the four-minute mark, one Baroni combination dug deep into Hendricks’ body and produced a loud sound similar to that of two pieces of 4 x 4 wood colliding. Then came a head shot Hendricks never saw coming. Hendricks’ mouthpiece went flying in one direction; his body fell in the other. He was out cold. Hendricks doesn’t remember anything else that happened thereafter on that fateful day in June 2007. Others who witnessed the “sparring session” informed him later that he had regained consciousness and then, a few minutes later, started sparring with someone else. It became clear that Hendricks was still woozy and unfit for more training, so he was told to go home. Before he left, bystanders recall him saying out loud that he was quitting MMA – after less than five minutes on the job. Hendricks doesn’t remember saying that. All he remembers is waking up the next day on his sofa at his new residence in Las Vegas. His father was sitting in a chair looking at him, as if he’d spent the whole night doing that to safeguard his son. “What are you doing staring at me?” Johny, still hungover from his beating, said to his father. “Oh, you’re back,” the father said. It wasn’t exactly music to Keven Hendricks’ ears. He had hoped his son was going to walk away from this MMA thing. But the next day, Johny Hendricks was right back at Xtreme Couture, a rookie hungry to learn this new concoction of kicking, punching and Brazilian jiu-jitsu skills that were so foreign to him. He never doubted he could someday be an MMA champion, partly because of his own alpha wolf drive and past accomplishments, and partly because so many top wrestlers like Matt Hughes, Chuck Liddell, Randy Couture, Josh Koscheck and Jon Fitch have dominated in this the skyrocketing sport. Today, just 14 months after embarking on his new career, Hendricks still lives in Las Vegas and trains regularly with the likes of Tyson Griffin, Mike Pyle and John Alessio, and he’s proud to say he has never been knocked out since the Baroni episode. All the hard work appears to be paying off. Hendricks is 3-0 and slated to make his WEC debut at 170 pounds next month in Florida against Alex Serdyukov (12-4). Many who tracked Hendricks’ storied wrestling career might suspect he is second-guessing his career choice, especially since when he turns on the television these days the Olympic Games are all over the tube. But while Hendricks’ father and his college wrestling coach, John Smith, had hoped he might pursue a spot on the U.S. Olympic Wrestling Team, Hendricks has no regrets about forgoing a shot on the squad. He feels no envy inside his heart when the Olympic Games in China are being broadcast. “There’s a time and a place for everything,” the 24-year-old said. “What does wrestling get from the Olympics? They’re covering swimming more than they do wrestling. I think that’s sad because wrestling is what started the Olympics. What they’re going to have to do is start putting some money back into wrestling. These guys are going to have to get paid more. part was not making the decision, but breaking it to his father and Coach Smith, a former Olympic gold medalist. “No, you’re wrestling,” Smith told Hendricks. “Coach, you’re an awesome person. But I’m not wrestling.” Hendricks said. Coach Smith and Keven Hendricks had taught the lightning quick athlete nearly everything he knew about winning in a combat sport. Johny Hendricks believes those lessons and accomplishments will translate into big success at the MMA level. In fact, Hendricks – echoing the sentiments of many converted wrestlers – maintains that wrestling practices tended to be more gruesome and torturous than MMA practices. If Hendricks’ MMA personality is anything at all like his wrestling demeanor, fans could be in for a treat. During his wrestling days, Hendricks was widely reviled and painted as a villain of sorts, sort of like the Terrell Owens of collegiate wrestling. Hendricks was perceived as the wild guy who, when an opponent got to the edge of the mat, might give him an extra shove out of bounds. He just seemed to have a hostile attitude and huge chip on his shoulder, and readily concedes that he would go into the other guy’s gym thinking, “This is my gym. This is my house.” A lot of bystanders accused him of poor sportsmanship because, if he won, he might overdo it on the celebration and rub it in on the other team. Hendricks said part of his fiery and flashy nature is just him being himself in the heat of battle, but there is also a method to the madness. “Coach got mad at me a couple times, but he knew he wasn’t going to change me,” Hendricks said. “I’m not going to change that. I tried to change it my senior year and I didn’t like it. Whenever the lights go down, and I step into that ring or circle, I become a different person. I want to win no matter what. I want everybody’s best shot. I don’t want a guy that comes out there and half-asses it. Let’s put on a show here, that’s what it’s about. I love to show emotion. I think one of the most important things is to get the crowd involved with what I’m doing. Fans want to see a good show. Yeah, of course you’ve got to back it up, too. So does Hendricks plan to tone down his antics in the cage, especially in light of his MMA baptism with Baroni? Yet, away from a wrestling mat or cage, Hendricks seems another person altogether. The willing villain becomes a perfect gentleman, packing his vocabulary with lots of “yes sirs” and “no ma’ams,” and displaying an easygoing and agreeable disposition. Plenty of people meet him and are surprised at how respectful he is, how dramatically his private persona differs from his public face. And, for the record, he believes his teammates at Xtreme Couture have also figured out that he is nothing at all like the spotty reputation that preceded him. He says that, even if he had to do it all over again, he wouldn’t change a thing about the way his first day in an MMA gym played out. While the hangover of the beating long ago faded away, the lessons of that session linger in his mind. The tango with Baroni embedded in Hendricks his most important lesson to date in his new sport. “I learned to keep my hands up and my chin down,” he said with a laugh. The seeds of determination are often planted by deprivation. 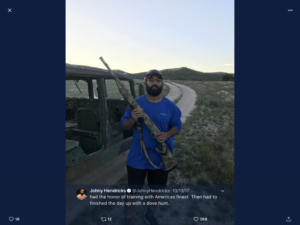 The latest example of this phenomenon being Johny Hendricks’ late-blooming love affair with hunting. A UFC knockout artist who is one win away from the title of “Baddest 170-pound fighter on the planet,” Hendricks occasionally gamed doves as a teen but never considered himself an avid hunter. A few years of living and training mixed martial arts in the Las Vegas desert in his mid-20s changed all that. Forget the trappings of gambling, booze, and then locking it all away in the “What happens here stays here” vault. The only temptation that tugged at Ol’ Johny was the urge to bag something. Forgive Hendricks for being so bothered by that 3-hour drive; he hails from the hill country in southeastern Oklahoma, home to some of that state’s finest waterfowl and turkey hunting, among a plethora of other game animals. If he’s going to drive 180 miles he wants to set up in the woods for a few days. As you can imagine, the bright lights of Vegas weren’t exactly paradise for a card-carrying Country Boy who refuses to cut his beard four or five months before all of his fights (including his upcoming Nov. 16 showdown against World Champion Georges St. Pierre). So far, so good. Hendricks has managed to hunt more than ever with his father. And he has already been dove hunting several times this year – even making time despite gruesome, two-a-day training sessions for his title fight. He commonly finishes a practice at 10 p.m., then drives his F-350 dually truck 30 minutes to go bow fishing until the wee hours of the morning (“I’ll sleep when I’m dead,” he says). Don’t be mistaken: Few elite fighters are as devoted to hunting, though former UFC champs like Brock Lesnar and Matt Hughes do jump to mind. Hendricks is almost as serious about outdoor adventures as he is cagefighting. And his favorite past-time or “relaxer,” as he calls it, is hunting coyotes. “Coyote hunting is probably my favorite because it’s like a cat-and-mouse game,” he said. “You go out there and you have to have a perfect set-up, perfect everything. But one thing a lot of people don’t understand about a coyote is that they will post up like 400 or 500 yards before they come in, behind a bush or sitting in a tree line trying to see where the noise is coming from. They scan the area. You’ll see her and then all of the sudden, she’ll be gone. Then you’ll see her 100 yards to her left or to your right. Once they feel 100 percent satisfied and safe is when they commit and that’s when you usually have fun. One particular coyote chase stands out among the rest. It happened when he was an absolute rookie at hunting coyotes. Joining him for the Oklahoma expedition were his brother and a buddy. They managed to intrigue a coyote, but the wily creature just wouldn’t come in. 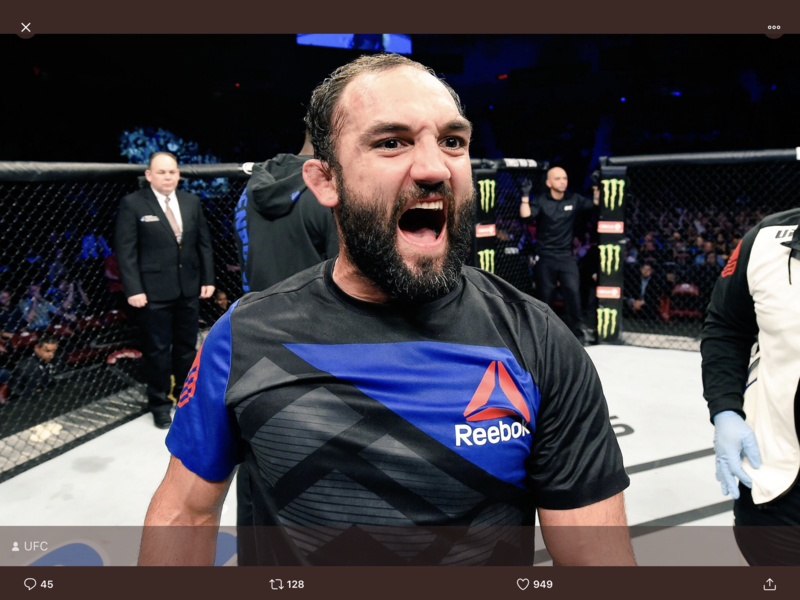 To understand Johny Hendricks the hunter it helps to understand Johny Hendricks the fighter. He was groomed to be an Olympic wrestling gold medalist, not someone who earns a paycheck getting punched in the face. And his pro career jumpstarted in the worst way: On Day 1 of his first MMA practice another pro fighter knocked Hendricks, at the time possessing zero striking skills, out cold. After coming to his senses, his father was there staring at him and expecting to hear that was the end of that. Flash forward to today and Hendricks is the one putting opponents to sleep with highlight reel KO’s. He is, like the animals he hunts, super-instinctive. He is also ultra-aggressive and possesses what few fighters do: Blazing fast hands, impeccable accuracy and one-punch knockout power. He sees some parallels between his education in the cage and the woods. “The difference is that in a fight you have to adapt second-by-second; with hunting you can’t make a deer or coyote come to you because you’re not locked in a 30-foot octagon,” he said. “In fighting you know there’s always going to be action. With (hunting) you need a lot more patience. Hendricks does a lot of his predator, deer, feral hog and dove hunting in nearby Paris, Tex., and Graham, Texas – both located in northern Texas and less than a 2-hour drive from Dallas. Bristow and Tahlequah are two of his favorite hunting playgrounds in Oklahoma. Experience has taught him several do’s and don’ts of the trade. “One thing I’ve learned is: Don’t go in the heat of the day!” he said with a chuckle. “I like to go early morning. That’s the best time I’ve found to go coyote hunting – that or when there is a full moon. You’ve got to really sit there and play around with the moon cycle. I wasn’t big into that but as soon as I started learning the moon cycle I started having more success. The UFC roster, far and away comprised of the world’s toughest hand-to-hand martial artists, often exceeds 300 athletes. Probably no other UFC fighter hunts and fishes as much as Hendricks. It’s baffling how the guy has enough energy to train like a maniac and yet still wake up at 5 in the morning to embark on a 3-day hunt. During his current fight camp, for instance, he’s enjoyed weeks of dove hunting and added a deer hunt for good measure. Not to mention all that late-night bow fishing. But a certain degree of prudence is essential, which is why Hendricks has adopted a rule: Three weeks before his fight, no more hunting (unless, of course, you consider Georges St. Pierre potential prey). The 3-week rule not only curtails his prized deer expeditions, but cost him the chance to bear hunt last year. It would have been his first such go-round with bears. “It ended up too close to my fight so I wasn’t able to go,” Hendricks lamented. “But I really want to go bear hunting. I want a rug (chuckles) or a sheet that goes over the bed. I’ve always really wanted to go bear hunting just for that reason. I am part native American and I’ve slept on some Buffalo blankets before and I want to shoot a buffalo, too, just for that reason. Such decor will give his home “a little Southern feel,” Hendricks added. He might not realize it, but fame could be just a straight left hand around the corner. But Hendricks, though highly likeable and quotable, might hide from the spotlight more than most. It will be interesting to see, if he wins the UFC title and becomes infinitely more recognizable, how he handles the next level of stardom. Because it seems that Johnny Hendricks thrives off the simple. He didn’t start fighting to make millions – just wanted to challenge himself. And though he smiles easy in any setting, he’s much more at home behind a rifle than he is a microphone. Still, if the man nicknamed “Big Rigg” runs over GSP as he has most others, the world around him will change. You get the sense Ol’ Johny won’t. He won’t be buying a Mercedes with that money. You get the sense no amount of fame will detach Johny Hendricks from his simple pleasures and his Man Code. “I moved out to the country so I can see the stars, just to get back to not hearing all the noise. Not hearing traffic or honking or rush-hour … all those things. It makes you appreciate life a little bit more,” he said.